So here I am back in Szeged after 15 months, give or take. It feels strange but oh so familiar, and each day we move more into familiar! 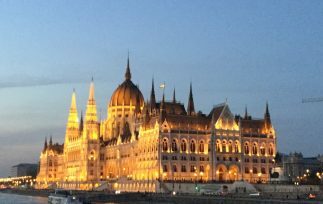 I arrived in Budapest Thursday after a gruesome flight (nothing out of the ordinary, just the typical packed like sardines coach experience–seriously thinking I should at least upgrade to extra legroom on the way back). Took the bus/metro into the city like a regular, and found my way to Airbnb #1 on Raday ut. I messed up the street and apartment number and went to the wrong place (my brain on no sleep) but figured it out and got settled in. Nice apartment, small and basic but comfy and in a good location. Despite my sleep deprivation, I decided I must get out into the glorious warm day and see Budapest, and so I did, strollling up the Danube a bit and around and about until my feet were tired. Had a beer and a falafel and eggplant pita at the Hummus Bar and headed home for a somewhat early night. The next two days were filled with the CEU workshop on “Dangerous Gifts,” where I heard a stimulating group of papers on gifts from the Eucharist to death, and from relics to forced Christmas gifts in NY department stores (the last my contribution). It was great to meet Alexandra, my Russian counterpart in 19C gifts, though her interests are literary not historical. Met interesting people and found it a valuable experience all around. I am sorry that I was leaving Sunday and could not attend the CEU rally Sunday evening. On Friday night I went to the Hungarian American Fulbright Association 25th anniversary celebration, a cruise on the Danube. It was packed with this year’s fellows, and many American and Hungarian fellows from previous years, as well as assorted dignitaries. Chatted with some old friends and made a couple new ones and had a nice dinner to boot. Also discovered that red wines from Villany are the bomb–yes, that is me, drinking wine! 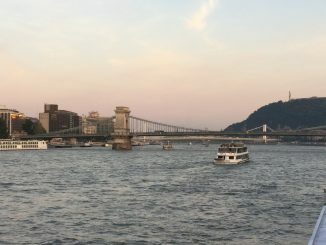 Below are a couple of shots along the Danube from the cruise. Tomorrow’s post will move on to Szeged.